Let us all together be part of the solution for Burundi. Wherever you are you can make a difference that will help the communities and the whole nation of Burundi. You will be part of a solution that helps to heal a wounded nation and to give hope for the future to all Burundians who wish to become self-sufficient and independent. Friends and friends of friends working together with JRMD team on worthwhile projects have already helped Burundian communities to rebuild and have helped create many strong families who are now self-sufficient. However many more still yearn for their most basic needs to be fulfilled. All donations made to the JRMD projects go through the Global Giving Foundation, a registered 501(c)3 entity, and are fully tax-deductible in the United States. You can also donate by check made out to Family Support Network and Memo JRMD and mail it to the following address: JRMD/YRWD, 15127 NE 24th Street, #31, Redmond, WA 98052. For the last 20 years, with donations like yours, we have changed the lives of thousands of people in Burundi by giving them hope for a future lived in safe, self-sufficient communities. 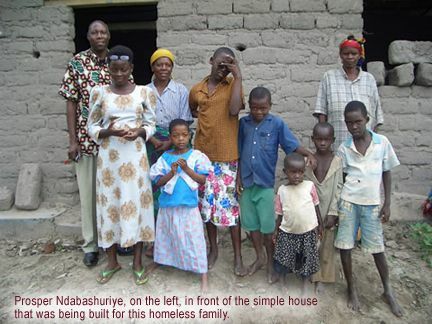 We have built 3,220 houses for 3,220 families living in different provinces of Burundi. We built Iwacu Kazoza School at Ruhagarika Village, in Cibitoke province and an orphanage is currently under construction. Today, Iwacu Kazoza School is providing education to 450 children who now have access to education thanks to your help. We provided thousands of children with school materials who can now go to school thanks to your help. Many other projects have been successfully launched, such as the Goat Project, the Women's Farming Project, a Micro-lending Project, the Clean Water Project, Africa America Exchange Project, etc. During our journey of 20 years, thousands of people have realized and held to the belief that Jesus Christ is the foundation of peace and reconciliation. The work of bringing healing and hope to a wounded community, through sharing Christ's Love and Compassion in Action continues. This is being done by joining hands with our partners and friends, and friends of friends. It is people like you who have helped to make all of this happen and I am very grateful to you all. May God continue to bless you in a very special way.